What is 888 Miracle Skin Oil? 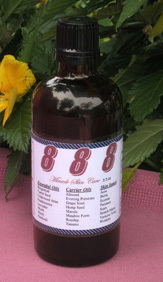 888 was custom formulated, specifically designed to be a super skin care product. The combination of the various essential oils and carrier oils make for a highly synergistic blend that has unlimited benefits for skin care. From ancient Egypt to ancient Rome, these natural oils have been used throughout history to improve complexions and to treat a variety of skin conditions. Essential oils have been shown to quickly affect the entire body when absorbed through the skin. Each drop of an essential oil consists of plant hormones, therapeutic chemical compounds and a highly volatile aroma. It is quite an understatement to say that an essential oil is a plant product, because it is not just a product from a plant but in fact the life-force of the plant itself. Certain types of essential oils can help oxygenate, heal, rejuvenate and nourish your skin. Unlike most synthetic ingredients in skin care products that remain primarily on the skin’s surface, essential oils can penetrate all the way to the subcutaneous tissue layer. The 888 formula is unique and was created for the person that ascribes to only the finest in personal skin care. Carrot Seed...is one of the most rejuvenating and regenerating oils that can be used in skincare and helps to improve the complexion, as it helps to remove toxic build up in the skin. Cedarwood Atlas... can be used to treat oily skin , relieve itching, and more serious skin conditions like psoriasis and eczema. Its action is sedative, astringent, antiseptic and it relieves itching. Lavender…helps the skin heal itself, stimulating cell growth, reducing inflammation, preventing scarring and balancing the production of oil. Excellent at fighting acne and problem skin. Myrrh…was included as one of the ingredients of the 888 formula, as it has a nearly magical effect on very dry, draping type skin. Myrrh is an excellent oil to use on older more mature skin, as well as very stressed, traumatized, dehydrated and dry skin. Neroli…helps in the treatment of broken veins and capillaries under the skin’s surface, while at the same time stimulating cell activity and growth, which in turn leads to a clearer, more rejuvenated skin. Also used for combating stretch marks, as well as scarring. Patchouli... has great success in helping to repair cracked, dry, sensitive and dehydrated skin. It also helps to calm inflamed skin as in the case with acne and problem skin. Almond...helps to leave the skin soft and satiny smooth. It is used to soften the skin, fight wrinkles, and promote a clear, young looking complexion. It is a protecting oil and is ideal for chapped and irritated skin. Evening Primrose…has antioxidant and anti-inflammatory properties, which in effect supports anti-aging, reduces redness in the skin, and is effective in helping with dry skin, eczema and psoriasis. ingredient for anti-aging products. It is also very useful for moisturizing and and excellent for use on acne prone skin. Hemp Seed…is used for the great effect it has on moisturizing and hydrating the skin, while bringing a host of other benefits such as reducing the appearance of wrinkles. This type of hemp seed does NOT containthe psychoactive THC ingredient and is therefore not subject to any legal restriction. Marula…has exceptional oxidative stability, which makes it an ideal choice for a modern cosmetic formula. It is rich in antioxidants and oleic acid , essential components for the maintenance of healthy skin. Meadowfoam...moisturizes the skin, ultra-violet protection, reduces wrinkles, signs of aging, and prevents moisture loss in the skin. Rosehip…is high in vitamin C, as well as other components that benefit the skin. It has exceptional emollient properties, while also acting as an antioxidant. Reduces the signs of aging, especially the lines around the eyes (crows feet) and mouth. Tamanu…is a remarkable topical healing agent with skin healing, anti-neuralgic, anti-inflammatory, antimicrobial, antibiotic and antioxidant properties. Tamanu oil fades stretch marks with incredible results.It also works miracles on scar tissue. Application: 888 can be applied with a few drops on the finger tips, or… a few drops on a q-tip, then apply to the skin. For eye application, apply to eye brow, temple, and cheek bone areas. Be careful not to get the oils in your eyes. If you do, DO NOT FLUSH WITH WATER. Use extra virgin olive oil to dilute.